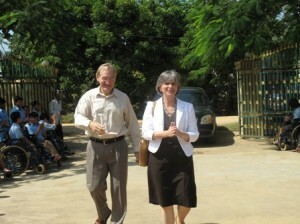 The program began in Cambodia in 2010 and has been successful beyond our imagination. This music/arts therapy program was later begun in Deschapelle, Haiti and is being introduced in Honduras in association with Dr. Jim Gosney. Marcel Proust wrote: “Only through art can we emerge from ourselves and know what another person sees. ”When we see art as the universal language that has the ability to unite all people, we understand the importance it has in the lives of people with disabilities. For a person who cannot speak, a dance performance may clearly communicate even the most complicated message. For a person with a mental disability who cannot communicate effectively through words, a painting rich with color and life may say more than verbal sentences ever could. And, for a person who has limited mobility, a song sung with emotion and spirit may produce a state of movement and joy.” By engaging in the arts, people with disabilities are able to contribute to our workplaces and communities, help extinguish old stereotypes regarding disability, and create a global culture truly representative of all people. The Viola Wheeler Music/Arts Therapy Program offers a means of healing and coping through group song, concerts and music recordings. Instruments, teachers and program specifications provided by GFH Global have allowed many disabled men, women and children to have a means of expression and hope while up-lifting spirits and relieving the many tensions and stresses that plague a less-abled person. In many cases, music therapy has been instrumental in career potential. Mrs. Viola Wheeler is the primary donor for the Music Program created in her name. A musical presentation from eighty students at Lavalla School and Orphanage in Kendal Provence, marked the official opening of The Viola Wheeler Music Program. 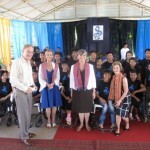 The US Ambassador to Cambodia, Carol A. Rodley along with The Viola Wheeler Music Program founders Arlene Willis and Dr. Christine Wheeler attended the opening ceremony earlier this month. 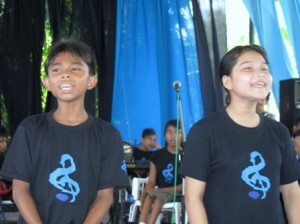 The students selected and performed both traditional Khmer and modern Cambodian Music in concert with instrumental, choral and solo performances. “The concert was truly overwhelming and we were astounded by the quality of the performance after only five months of training.” Said Arlene Willis, Chairman and Founder of Grapes for Humanity, US. Lavalla School and Orphanage has three buildings and workshops funded by Grapes for Humanity, US. It was established in 2000 as a project of the Marist Brothers of Australia and is run by Brother Terry Heinrich and Brother Darryl Slater. The school houses approximately 100 students with disabilities and teaches them academic and manual skills to enable them to find work upon gradation.